This paper analyzes the language of Japanese spam mails. Special focus is on one specific type of spam: make-believe dating invitations by women looking for physical relationships with male partners. A corpus of 434 spam mails was compiled between 2009 and 2012. Looking at two of these messages in detail, the paper examines the specific properties of this type of spam. These include linguistic features commonly associated with computer-mediated communication (CMC) and Japanese women’s language. Their function is to increase the “authenticity” of the messages. In a second step, I analyze how spam mail writers in their messages deal with the problem of portraying female sexuality and desire, with a special focus on the role of linguistic taboos and transgressions thereof. In contemporary Japan, people labeled as “burakumin” (‘hamlet people’) are commonly described as the descendants of Tokugawa-era outcasts of Japan, who were engaged in special occupations (e.g., leather industry, meat packing, street entertainment, drum making) and compelled to live in separate areas. Despite the heterogeneity of these populations, determination of “buraku origin” (buraku shusshin) has remained fixed over time and is based on one’s birth, former or current residence in a buraku, and engagement in the buraku industries. This paper illustrates representations of the buraku through local and community-based initiatives and narratives. It explores the short story “Yomigaetta Kurobe” (‘Resurrected Kurobe’) by Kawamoto Yoshikazu and the role and activities of the Archives Kinegawa Museum of Education and Leather Industry, located in Kinegawa in Sumida Ward (Tokyo) with a special focus on children’s participation. By reinterpreting the “Edo tradition,” activists, educators, children, and other individuals in the community transform the “otherness” and blur the boundaries to normalize yet take pride in the “specialness” of the buraku. They do so by drawing on commonplace factors including hard work and the everyday usefulness of objects, as well as special qualities such as skills and craftsmanship. Sakamoto Ryōma is said to have united the fiefs of Satsuma and Chōshū in their attempt to overthrow the Tokugawa shogunate, which eventually led to the Meiji Restoration. He is one of the most popular historical figures in contemporary Japan. However, while the remembrance and commemoration of the darkest decades from the 1930s to the 1940s in Japanese history have been researched extensively in the West, cases such as Sakamoto have been mostly neglected. This paper examines Sakamoto’s current popularity and puts it into the context of Pierre Nora’s concept of “realms of memory.” Nora’s concept describes how national identity draws upon various memories and transforms them into interconnected points of reference. The analysis starts by scrutinizing on the many historical novels that have been written about Sakamoto as well as the historical TV drama Ryōma-den, produced and aired by public broadcaster NHK in 2010. Situating Sakamoto’s case in the overall picture of Japanese “realms of memory” reveals the political dimensions of memorizing him. Sakamoto has been cherished by conservatives and left-wing students alike. The paper concludes that Sakamoto and other heroes such as Saigō Takamori should be included into Western research on collective historical memory in Japan because they shed light on the complex entanglement of memory and politics in Japan. Social scientific research on Japanese youth experienced something of a boom in the 2000s and is attracting further attention following the triple disaster of 11 March 2011. But while advances have been made in understanding young people’s relationship to work, marginalization, and activism, for instance, the premises of this emerging field of research remain shaky. Despite cursory critiques of associated labels and recurring “moral panics,” the dynamics of youth problems have not yet been sufficiently understood. This paper draws on the well-known case of the “nerdy” otaku to illustrate how youth problems arise from the complex interaction of labels, incidents, and prominent actors – that is, their more visible side – with underlying assumptions, strategies, and interests – that is, the less salient dimension of such problems. After highlighting important connections between the otaku phenomenon and the two subsequent phenomena of hikikomori and NEET, four key mechanisms are set out that govern the way youth problem debates emerge and evolve more generally (i.e., the respective roles of “industries,” “translators,” rhetorical strategies, and youth as a “muted group”). 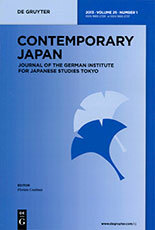 The paper concludes by relating the findings to post-tsunami Japan, arguing that the way in which young people are debated in the 2010s may turn out surprisingly similar to the debates in the 2000s, unless the very configuration of the institutions and actors that construct youth debates changes. 神国の行方 – Where to next for Shinkoku thought? This is an English translation of “Shinkoku no yukue” (神国の行方 ‘Where to next for Shinkoku thought?’), the final chapter of Shinkoku Nihon (神国日本‘Japan, Land of the Gods’) by Satō Hirō. In this chapter, Satō traces the history of the controversial notion of Japan as “shinkoku” – a divine ‘land of the gods’ – that is often associated with ultranationalism in Japan. Taking issue with what he sees as the common misunderstanding of shinkoku thought in contemporary Japan, Satō argues for the way it ought to be conceptualized and studied in future.